Plate 40 from an album of chromolithographs of William Simpson's "India: Ancient and Modern". 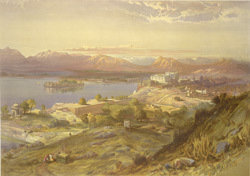 Simpson considered Udaipur, the capital of the Rajput state of Mewar, the finest and most strikingly picturesque city in India. Udaipur was the seat of the Sisodia clan of Rajputs who ruled Mewar. Built by Maharana Udai Singh in the mid-sixteenth century, it was renowned for its setting around tranquil Lake Pichola, and its beautiful palaces.